Breaking It All Down: The ’Zine is a fanzine inspired by a multitude of factors. The fanzine’s editor and writer, Alex Case, was motivated to create the zine after attending Jerry Kaufman, Suzanne Tompkins, and Ben Yalow’s excellent panel on fanzines at OryCon 33. Additionally, while he enjoyed doing videos on SF & Fantasy novels, video games, and films on YouTube, through his web series Breaking It All Down, he never really got the dialog he wanted with fans there, especially the SF fandom community as a whole. Plus, keeping up a weekly video schedule while also being a full-time student is difficult. 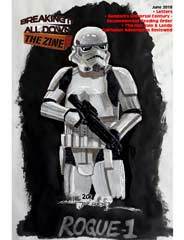 So, Breaking It All Down: The ’Zine was started - a quarterly+ fanzine for reviews and discussion of SF fandom, as well as Science Fiction & Fantasy in all its myriad forms, from novels, film and TV, but also SF anime, manga, graphic novels, along with SF video games. And why the title? Well, because Alex didn't feel he had the rep or visibility to reference the seminal SF news-magazine TV series Prisoners of Gravity with his web series, and he wanted a title that reflected the analytical tone he intends to take through the show and fanzine. Letters of Comment can be sent to alexander (dot) Case (at) Gmail (dot) Com, and Alex asks you put [LoC] in the title, so he knows what to look for. Constructive feedback is definitely appreciated, along with recommendations you'd like to see discussed or reviewed.